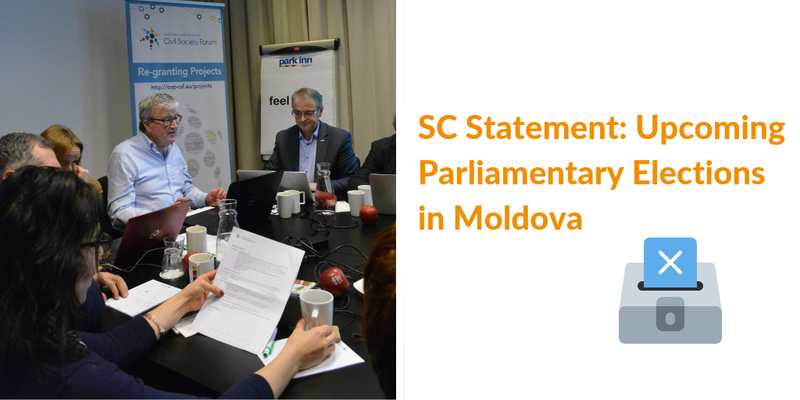 During their meeting on 7 February 2019 in Brussels, Eastern Partnership Civil Society Forum (EaP CSF) Steering Committee issued a statement on Moldova, addressing the situation before the Parliamentary elections scheduled for 24 February 2019. The message coming from civil society is clear: “we call on Moldova’s judicial and electoral institutions to ensure that the country’s citizens will be able to fully exercise their democratic rights”. Unfortunately, the signs coming from the ground are not encouraging: there are reports of hate speech, misuse of public resources and involvement of public employees in the signature collection procedure. The Steering Committee points to the preliminary report by election observers, dispatched by Parliamentary Assembly of the Council of Europe (PACE) last month – which draws attention to instances intimidation and vote-buying, facilitated by public officials. EaP CSF member organisation, Promo-Lex Association, has raised their own concerns and recently found itself a centre of controversy, with public attacks on its “professionalism and impartiality”. In this respect, Promo-Lex, a lead monitor of the electoral process, enjoys full confidence and support of EaP CSF. Moldova “faces the prospect of being captured by its oligarchs”, sums up the Steering Committee. Considering that the courts decided to overturn the result of the Chisinau Mayoral elections last year, the situation is being watched closely. The Steering Committee is paying attention to reports coming not only from PACE, but also the European Parliament and the Office of Democratic Institutions and Human Rights (OSCE-ODIHR). Further infringements, electoral fraud and another invalidated result calls for sanctions against responsible officials, finishes the statement.